Acknowledged author Yale Kamisar wrote Modern Criminal Procedure, Cases, Comments, & Questions (American Casebook Series) comprising 1625 pages back in 2015. Textbook and etextbook are published under ISBN 1634591607 and 9781634591607. 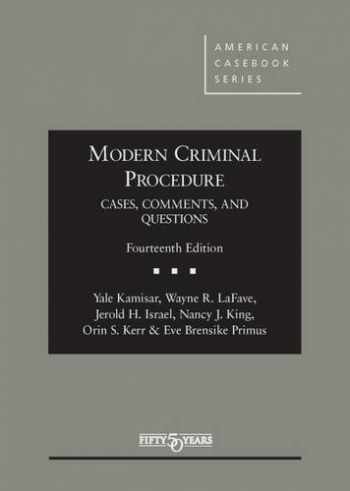 Since then Modern Criminal Procedure, Cases, Comments, & Questions (American Casebook Series) textbook received total rating of 4 stars and was available to sell back to BooksRun online for the top buyback price of $86.54 or rent at the marketplace. The Fourteenth Edition continues to include all the material required to master the essential issues that arise in both state and federal criminal cases. The book’s comprehensive coverage of constitutional, statutory, and ethical rules regulating the criminal process has made it one of the few textbooks that students over the years have opted to keep as a reference for their work as prosecutors, defense attorneys, and judicial clerks. The new edition also continues the custom of incorporating the most thoughtful and provocative commentary available. The authors bring together the latest statistics, relevant legislative trends, and insightful policy and scholarly debates, facilitating critical analysis of the process and its potential reforms. This unique and always up to date framing of the issues has made the book the nation’s premier text for teaching criminal procedure year after year.